I picked up my grandfather's quilt last night to work on the quilting. It had been pushed to the bottom of the pile while I was working on my sister's quilt and xplusalong. I'm really pumped to quilt Sunshine Daydream, but I really need to finish this one first. So I started a while ago quilting with gray Konfetti in the top and the bobbin, but realized too late that I should have used red in the bobbin, to match the backing. So when I picked it up again, I did that. 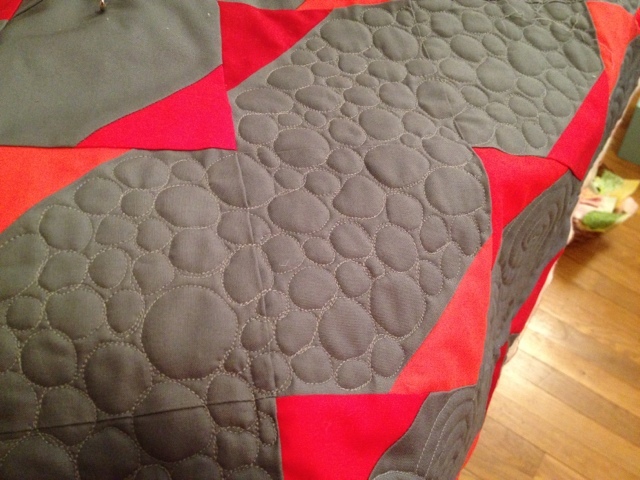 I started quilting and about 30 seconds in, I realized that the red was *juuuuust* peeking through the top, so I adjusted the tension and kept going for a few more seconds. Not bad, but it really bugged me. I need to fiddle with the new machine's settings for a bit before I try to quilt with drastically different colors like this. So I pulled the quilt out, and changed the bobbin again. Then I realized that if the back had four square inches of red thread and the rest was gray, it would really bug me. 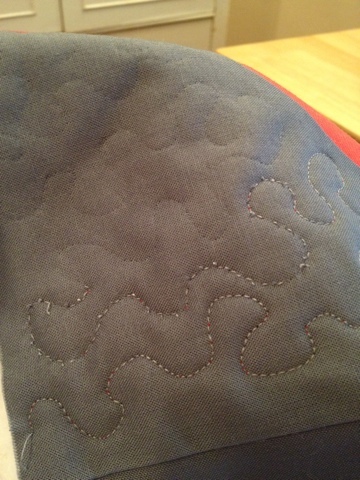 So that's how 45 seconds of quilting became an hour of seam ripping. But hey, that's one of the reasons I put a tv in the studio, right? You'll see in the pictures that I started with stippling, but decided to do some pebbling after I ripped that out. So I guess it's a good thing, right? I love this backing, I scoured for it online with no luck and then happened to find it at one of my LQSs. It has little planes on it - my Grandfather is a retired AF pilot. It was tough finding an airplane print that wasn't cartoony! Oh my...been there done that! I admit that needing to rip things out is my least favorite part of sewing! Love the pebbled effect - think I want to try that sometime soon! I love your quilt top - and the quilting is gorgeous! Are you following a pattern or tutorial for it? Thanks! I'm not following a pattern. I just made some stitch and flip triangles and rearranged them on my design wall until I liked how they looked. Oh very nice! I love pebbling too. Also, stacking a u shape in a set of 3, all different directions, is pretty addictive as well...and like pebbling, you can change the size to suit your design. 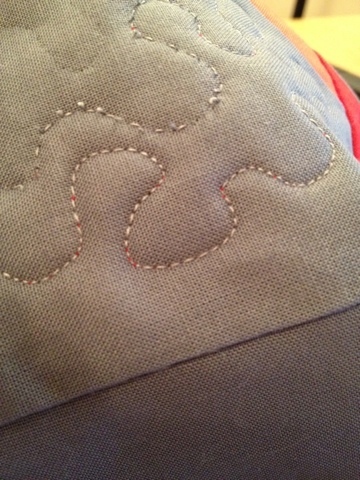 I love contrasting thread for quilting, so I think the grey on red is nice. Can't wait to see how you quilt Sunshine Daydream. 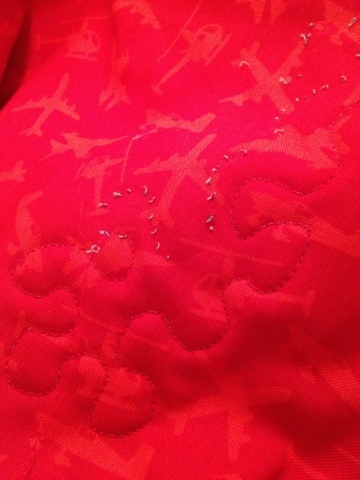 Ugh--I also had to rip out some quilting stitches last night, so I can well sympathize. But your pebbling looks absolutely gorgeous, so your extra effort was well worth it! I've enjoyed watching this quilt come together! Love the pebbles! I feel your pain about ripping out, but it looks like it was well worth it. The pebbling is gorgeous! I liked the pebbling very much. But from the little bit of quilting I've done, I've learned to accept that you need to have the same color threat in the top and the bottom. Yes, it is going to show on the back, but even the show quilters seem to have accepted that. Your pebbles look great! And I love that airplain backing, it is such a nice compliment! I guess no one that has not made handmade gifts knows and values the efforts of it's process. Some projects go all smoothly other take much more trouble to be done! Thumbs up for persevering until you were happy! Thanks everybody! Taking out the stitching was worth it! But it's amazing how much quilting there was in such a small area! The pebbles look great! Sorry to hear about the ripping!